Openers nowadays are more advanced and complex than ever. If you're interested in getting a new one installed, or upgrading your old unit, we work with all of the major manufacturers, and our experts can recommended which model is going to be the perfect one for you. The opener is a motorized device that powers the movement of your door. It essentially provides it with the push and pull action that you'd have to physically do yourself if you didn't have this device installed. There are three common types of drive-systems that this type of unit can use. Each one has different advantages and disadvantages. Belt-drive openers are extremely quiet, which makes them an excellent choice for people with a bedroom next to their garage. However, models of this type tend to be more expensive. Chain-drive openers are strong and fairly cheaper than their counterparts, yet they require somewhat frequent maintenance, and are also very loud and noisy. As for screw-drive opener, units of this type use a threaded rod to move the door, which means there are only a handful of parts involved in their operation. This translates to less maintenance. Their major downside is that they also have a relatively noisy operation, and they can sometimes be affected by extreme temperature shifts. 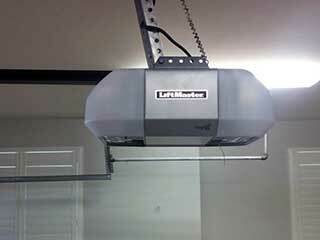 Although the type of drive-system is an important factor, the popular brands that we can offer you, like LiftMaster, Chamberlain and Genie, have a range of models that implement a lot of useful additional features. Wi-Fi compatibility, for example, will allow you to control your opener from virtually anywhere. Some models also include added safety features such as rolling code technology, vacation setting or force guard control. Our professionals can suggest the best option for your needs and make sure that you don't neglect to take things like the weight of your door (which determines the horsepower output you'll need) into consideration. We'll be more than happy to explain the benefits and differences of every model to you. The best way to avoid disastrous situations and costly repairs is with regular service appointments. However, sometimes things can go wrong seemingly out of the blue. During those scenarios you can count on our team to come to your aid as quickly as possible. If your door suddenly refuses to open due to a worn out motor gear, or if it keeps reversing because the opener safety sensors are misaligned, our technicians will replace or realign the parts in question and make sure the system returns to its proper operation. If your opener starts acting up, or you want to upgrade to a new and more technologically advanced unit, our team at Garage Door Repair Gig Harbor is here for you. Contact us today to book an appointment.